Someone on Instagram asked me to share my tips for selecting inexpensive clothes that look chic and I thought I should answer in this blog post. Book mark this post because every tip applies forever and I live by them. Trends change but the guidelines do not. NOTE: I will say this, it really isn’t who you are wearing but HOW you are wearing it. Don’t get me wrong. I am the first to hold up my hand for owning designer items but, after years of shooting street style, the one philosophy of ‘how’ versus ‘who’ always wins. Expensive clothes hang perfectly. When I shop at an H&M or similar spot, I pick coats that fit shoulders well. The above H&M leopard print coat is a good example. In general I will go up one size so it hangs correctly with no bunching. More on sizing next. Clothes that skim off the body tend to flatter most so my biggest tip is to go up up up in sizing. Don’t get hung up on labels, so many are off the mark anyway and make you want to slit your throat. I have coats, skirts and/or dresses that are US 16. Size does not matter, it’s about how it hangs. Tip: Do the same with jeans: Go up a size (heck two if necessary) to get that perfect slouch while still keeping a semi fitted look. This applies well for straight leg jeans and wide leg trousers. Avoid anything that feels rough or could bobble. This five year old pleated skirt is by Alice & Olivia. It is mid range pricing and I wear it every year. It’s fluid and flows when walking. Tip: Note the inner lining is long. Avoid linings that stop half way up exposing a 50% leg. Look for skirts that feel super soft and have a good weight to them. I’ve noticed that with pleated skirts, the heavier the material and the more defined the pleats, the better the skirt flows when walking. I know for sure that the velvet grey Topshop skirt linked below is incredible in person. I own the pink but that charcoal is an ever green. Unless it’s your preference, avoid denim with a lot of stretch. They read leggings and you feel like a stuffed sausage. I stick to rigid traditional denim that don’t cling all over, think vintage Levi’s. H&M does a few that fit amazing when in the right size (re-read above on sizing). Nobody knows if they’re a pair of Current Elliott’s or Frame The raw or step hem finish is an easy DIY job or buy it done for you. Chic usually (not always) entails being a little more covered without looking frumpy. Generally speaking, I prefer to wear skirts midi to maxi length. In the right material, the long length makes the skirt full and it flows better. Tip: I shop them from the Tall department or by going up approx two even three sizes so the skirt stops much lower on my legs. The above skirt is several sizes too big for me. Tip: If a sweater isn’t long enough, buy a sweater dress. The one in these photos is an old H&M sweater mini dress that I bought with the intention of wearing as a knit top instead. 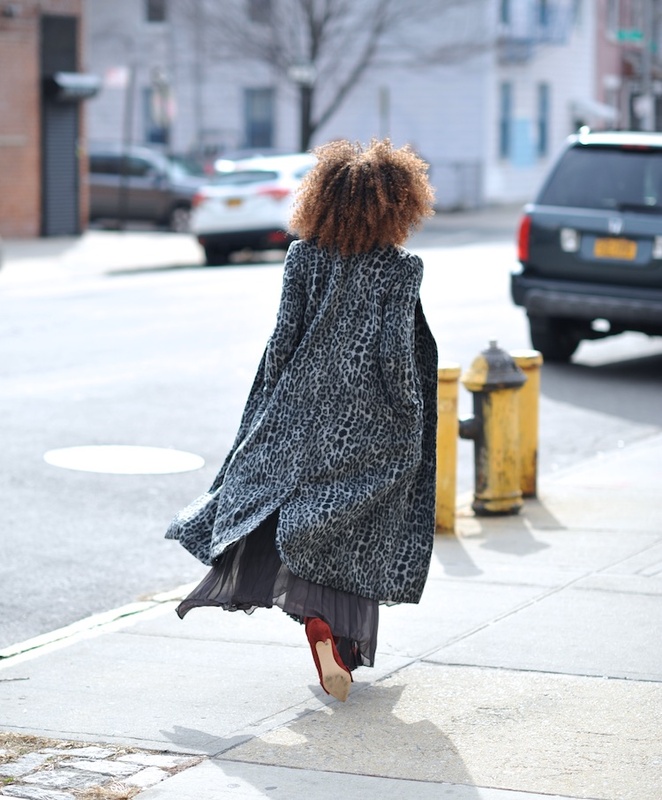 Lately I’ve been into changing up the silhouette of coats and oversized outer pieces by cinching them at the waist. It’s a quick way to make a piece look more individual. I’m using a Gucci belt in this post, but any timeless simple belt works. Look at this older post wearing a grey Zara men’s coat. I used a skinny vintage belt to cinch in an oversized men’s coat. Tip: Woven belts are life savers because you can cinch them anywhere along the belt. Generally speaking, skinny belts are more versatile. The wider the belt, the more dramatic the look. Tip: Consider cinching in a fur coat for a similar effect. Click here to see this coat that I cinch with a skinny white belt. Invest in leather. You can get them inexpensively from vintage, eBay or Etsy and stick with neutral colours. Black and brown are the most versatile and timeless. They are the colors that I wear the most. No they don’t have to cost a fortune although I love a good designer shoe (you saw my shoe shelf on Instagram right?). There are so many jaw dropping shoes around that look more than what they are because of their cut and overall look. The above are from Zara (found on eBay!) Love them or not, Zara does a pretty good job at making affordable styles if high end isn’t your speed. The kitten heel/pointy toe boot are hallmarks of an old school timeless boot from the fifties and more recently with Balenciaga or a classic Christian Louboutin style, so I’m mimicking that vibe with an inexpensive version. Stick to one hardware color on an outfit – bag included. Dull hardware tends to feel more timeless over shiny which can read trendy. Stay away from thin sheer materials (unless it’s supposed to be). Minimal reads expensive. Stick to staples in neutral colors: black, white, grey, navy, brown and camel. You can mix and match for months based around those six tones. Smaller floral prints tend to look better and date slower than larger all over prints (read big flowers). The either/or rule: slim on top means oversized bottoms and vice versa. Classic sunglasses makes almost anything a look. Ray-Ban aviators are the most versatile. Team maxi skirts and dresses with heels. Team short skirts and dresses with flats. Shop the men’s section for single/double breasted coats, v or crew neck knits or chunky knits. The styles are classic, details are stronger and the boxy cut gives a Celine-like slouch that would make Phoebe Philo proud.